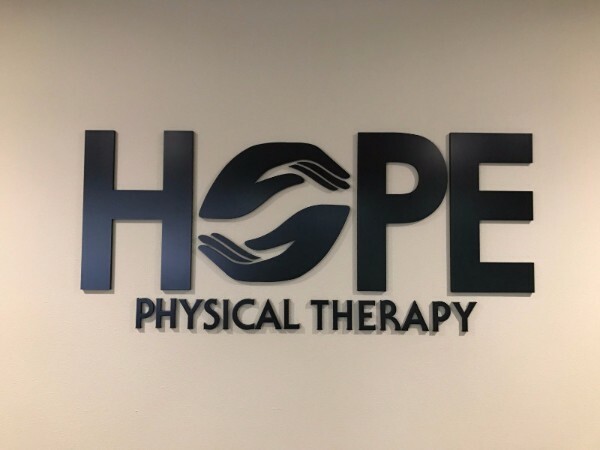 Located right across the Fountain Valley Hospital at 10900 Warner Avenue #117, Hope Physical Therapy personalizes rehabilitative care for patients. 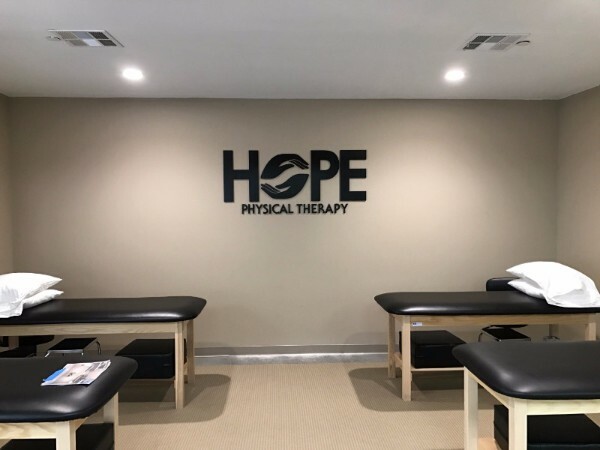 Goal setting and needs analysis are two components that make this clinic popular with those in need of PT services. 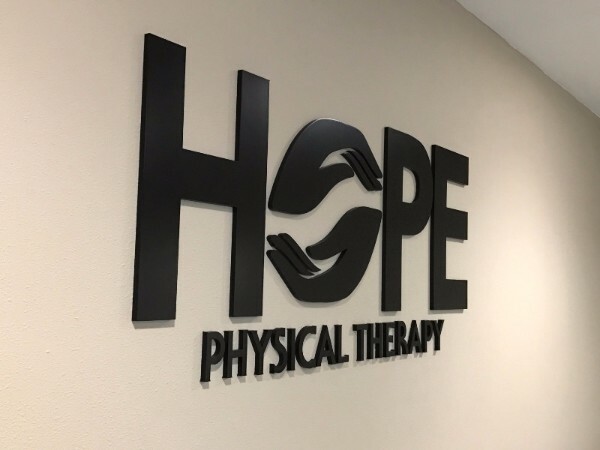 When the company’s management team contacted us to discuss the design, manufacture, and installation of a 3D lobby logo sign in Fountain Valley, CA, we met up with our clients. Combine your logo with 3D letters! During our consultation, we learned more about the customer’s vision. The goal was the creation of a sizable display that would be mounted in the main treatment room. We sketched a presentation that featured the logo depicting two hands incorporated with the lettering of the company’s name. The client approved, and we manufactured the product with half-inch-thick PVC that we painted in a matte black tone. It now looks fantastic against the beige cream-colored wall surface and expertly delivers a brand message that impresses clients. Logo wall signs brand your business! PVC is a favorite material for 3D logo signs because of its light weight as well as its ease on the budget. It is ideal for rounded features and shows off colors beautifully, particularly when painted with a matte finish. But it is not the only material choice you have. Metal. Brushed aluminum is a popular choice for companies in the financial sector. Other options include brass, copper, and stainless steel. Finishes depend on your taste. Foam. When you want depth, foam is the ideal selection. Because we can make it stand out up to three inches, it is suitable for the presentation of large-scale lobby logo signs. If you had your heart set on metal, we can install thin metal laminates over the foam, which make the product look like the real thing. Acrylic. More than just a fiberglass look-alike, this product lets you choose a chic, contemporary display or a stylish, elegant presentation. Dimensional letters, printed transparent boards, or vivid scenes featuring your corporate logo added to the mix, acrylic does it all. Material combinations. Brushed metal and painted foam create a great look. The same goes for black aluminum and brushed gold (or cast metal). Wall logo signs great for waiting areas. Typically, our clients like us to mount lobby sign components flush to the wall. But when working with a logo board, it makes more sense to use standoffs. These products come in a variety of sizes, shapes, and colors. The most commonly selected appearance is brushed aluminum in a round shape. Some clients have begun suspending lobby signage from the ceiling as well. Depending on your reception area’s layout, this technique can be quite eye-catching and makes a fantastic impression. Ready to order a new logo wall sign? 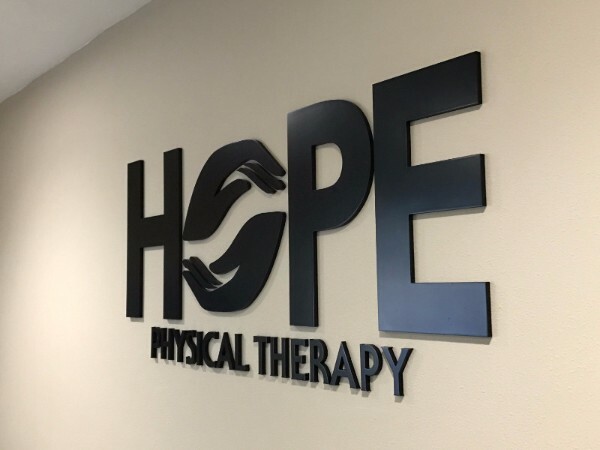 Whether you need lobby signs for healthcare providers in Fountain Valley, CA, or for any other type of business in and around the Los Angeles and Orange County areas, we can help. Contact our dimensional letter and logo board specialists to talk through your plans for a display. We assist you with design sketches, manufacturing, and the final installation. Call us today to get started on the project!